JamHub was created to allow you to play more, and the experience rocks! JamHub is the portable, affordable way to make more music. Jam Hub GreenRoom Studio System inc. The JamHub GreenRoom silent rehearsal studio provides silent full-band practice with the input flexibility and mixing capability to allow everyone in your band to get the mix they want while rehearsing. The 5-pin MIDI In and Out connections are included for connecting synths, sequencers and other external MIDI gear. This premium Hi-Speed USB connection and USB/Direct blend knob enable you to have zero-latency monitoring of your inputs, making the recording process easier than ever. The audio interface is the key to making professional recording. At the heart of Scarlett Studio is the Scarlett 2i2. This interface connects to your Mac or PC via the USB port and provides 2-inputs and 2-outputs to your music software. Video of RSG10 (1) Technical Pro AX1200 1200 Watt 2-Channel Power Amplifier. Item Code: (2) RSG10 AX1200. This high level of quality can also be found in their professional grade amplifiers. Their latest addition is the AX1200 2U Professional 2CH Power Amplifier. Looking for a fast, affordable way to upgrade your computer sound system?. Maybe you’d like a great- sounding alternative to the built-in speakers on your portable synth/ keyboard?. Or, maybe you’d like to turn your computer into your personal studio. Klanglich arbeitet die Central Station auf kompromisslos hohem Niveau. Der gesamte Signalweg ist strikt passiv, also ohne ICs oder Operationsverstärker, um jegliche Färbung oder Verzerrungen von vornherein auszuschließen. (2) Rockville RSG10 Single 10” PA Speakers Totaling 800 Watts. (1) Rockville RPA5 1000 Watt Peak / 500w RMS 2 Channel Power Amplifier Pro/DJ Amp. Video of RSG10 The RPA5 is optimized for 4 and 8-ohm speakers, and is equipped with a stereo/mono speaker output switch allowing for quick system impedance optimization. Audient iD14 (10in/4out Audio Interface). Audient iD14 Overview. Audient's Creative Hub Software Bundle Included! iD14 provides you with high performance AD-DA converters. The importance of converters should never be underestimated. W@W!! OVER $800 VALUE AT LESS THAN HALF THE PRICE!!!! (1) Focusrite SCARLETT 2I2 2nd Gen 192KHz USB 2.0 Audio Interface w/ Pro Tools First. As you’d expect, it works flawlessly with all major DAWs on Mac and PC. Scarlett 2i2 works flawlessly with all major DAWs on Mac and PC, and all the software included is simple enough for beginners, yet sophisticated enough for advanced users. Schwarzes 6-Kanal-Mischpult mit Crossfader, Talkover-Funktion und Vorhörfunktion mit Wahlschalter. Endstufe und Mischpult mit Power LEDs. robustes ABS-Gehäuse mit 35mm Stativflansch, Tragegriff in Monitor- und Stapelbauweise. Introducing, the Rockville RCM PRO, our newest high-quality, professional studio/recording condenser microphone! This microphone is very sensitive to incoming sounds to give you the best possible sound! Ein 10-Band-Equalizer hilft beim genre- und vorliebengerechten Feintuning Ihres Sets. Mächtiger Profi-Mixer mit vielfältigen Anschluss-Optionen. Weitreichende Soundkontrolle über 10-Band-Equalizer. (1) Focusrite SCARLETT 18I20 2nd G 192kHz USB 2.0 Audio Interface w/ Pro Tools First. Scarlett 18i20 works flawlessly with all major DAWs on Mac and PC, and we continue to work with Avid to ensure it is compatible with every update to Pro Tools. ABS-Chassis mit Tragegriffen, Stativflansch und Aufbewahrungsfach auf der Geräterückseite. Ibiza Combo210 PA-Lautsprecherboxen Paar USB SD 300W RMS AUX. aktives 2-Wege-Bassreflex-Lautsprecherpaar mit 8-Kanal Mixer und 2 x 150 Watt RMS Leistung. (1) Focusrite SCARLETT 6I6 2nd Gen 192kHz USB Audio Recording Interface. As you’d expect, it works with all major DAWs on Mac and PC. Scarlett 6i6 works flawlessly with all major DAWs on Mac and PC, and all the software included is simple enough for beginners, yet sophisticated enough for advanced users. 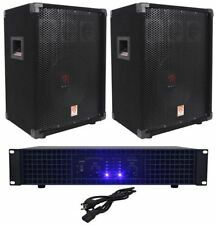 (2) Rockville RPG12 12" Powered Active 2-Way DJ PA Speakers Totaling 1600W. Video of RPG12 The ultra-efficient design is amazing! 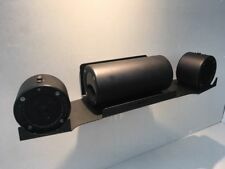 The RPG12 has a versatile trapezoidal enclosure design which allows you to use it as a PA speaker or you can use the included mounting brackets and lay it on its' side to be used as a floor monitor. Stativ-Transporttasche und Kabel-Mikrofon. 2 x Lautsprecherbox. praktisches Transportfach in der Boxenverkleidung zur Aufbewahrung von Zubehör. Stativ-Transporttasche und dynamischem Kabel-Mikrofon. Lautsprecher-Bauweise: Passiv. Audient iD4 USB Audio Interface. Audient's Creative Hub Software Bundle Included! Audient iD4 Overview. iD4 provides you with high performance AD-DA converters. The importance of converters should never be underestimated. Cubase LE Recording Software! (Download). 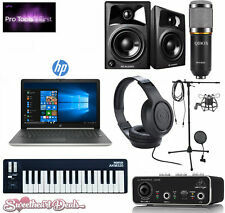 Includes Behringer Monitors, Stand, Pop Filter and Shockmount! Tascam US-1X2 1 In 2 Out USB Audio Interface. Tascam TH-02 Headphones. Behringer Monitors. With Cubase LE you can turn your Mac or PC into a beautiful and easy-to-use music studio. (1) Focusrite SCARLETT 2I2 2nd Gen 192KHz USB 2.0 Audio Interface. This includes Pro Tools | First 12 plug-ins: Tape Echo, Eleven Lite, Black Op Distortion, Gray Compressor, Graphic EQ, Flanger, Vibe Phaser, Roto Speaker, Sci-Fi Ring Modulator, Vari-Fi Speed Shifter, Studio Reverb, and In Tune Digital Tuner. L@@K!!! TOTAL MSRP $1077 SELLING FOR $414.95 !!!! Audient iD4(2in/2out Audio Interface). Audient's Creative Hub Software Bundle Included! iD4 provides you with high performance AD-DA converters. The importance of converters should never be underestimated. (1) Presonus Bluetube DP V2 2 Channel Tube Mic Pre-Amp DP2. Features of BLUETUBE V2 Bluetube V2 Manual English (PDF). Item Code: BLUETUBE V2 DMS40 PRO-M50. #1 Authorized Presonus Internet Dealer! (1) Samson MBA18 18" Microphone Boom Arm Studio Podcast USB Mic Stand w/ Desk Clamp. (1) Focusrite SCARLETT 18I20 2nd-Gen 192kHz USB 2.0 Audio Interface. Scarlett 18i20 works flawlessly with all major DAWs on Mac and PC, and we continue to work with Avid to ensure it is compatible with every update to Pro Tools. Dazu besticht der Verstärker durch seine integrierte Bluetooth-Funktion, die kabelloses Musik-Streaming in Verbindung mit Bluetooth-fähigen Geräten wie z.B. Laptop, Smartphone und Tablet ermöglicht. Außergewöhnlicher HiFi- und PA-Misch-Verstärker mit ungewöhnlicher Anschlussvielfalt, gutmütigen Klangeigenschaften und blauer LED-Effektbeleuchtung. (1) Focusrite SCARLETT 2I2 2nd Gen 192KHz USB 2.0 Audio Interface w/ Pro Tools First. Free bi-monthly plug-ins from Focusrite’s Plug-In Collective. Authorized Focusrite Dealer! Focusrite Red Plug-In Suite. 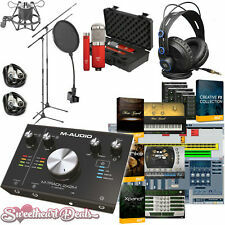 Audient iD4 USB Audio Interface Recording Bundle! Audient iD4 USB Audio Interface. Audient's Creative Hub Software Bundle Included! Audient iD4 Overview. iD4 provides you with high performance AD-DA converters. All the quality components to start a recording studio. Just add the computer or laptop. Propellerhead Reason 10 Intro recording software. Use loop recording tocapture multiple takes of a performance, so you can nail that perfect guitar solo or let your spontaneity rule. Focusrite Scarlett Solo Studio (2nd Gen) - 2 In / 2 Out USB 2.0 Audio Interface With Mic and Headphones. (1) Focusrite SCARLETT SOLO 2nd Gen 192 KHz USB 2.0 Audio Interface. As you’d expect, it works flawlessly with all major DAWs on Windows and Mac. Authorized Focusrite Dealer! Focusrite Red Plug-In Suite. Zephyr Xstream is the world’s leading ISDN codec, compatible with the widest variety of third party codecs. All Xstream models feature professional balanced analog inputs/outputs, as well as Livewire® I/O for quick connection to Axia® networks; AES/EBU I/O is standard on rackmount model. Audient iD14 USB Audio Interface Recording Bundle! Audient iD14 Overview. iD14(10in/4out Audio Interface). Audient's Creative Hub Software Bundle Included! iD14 provides you with high performance AD-DA converters. Anschlüsse: 1 x 6,3mm-Klinken-Mikrofon. A-Ausgang, 1 x 6,3mm-Klinken-Mikrofon. B-Ausgang, 1 x 6,3mm-Klinken-Mix-Ausgang. 1 x Aktiv-Box, 1 x Passiv-Box, 2 x Funk-Mikrofon, 1 x Funk Empfänger. Schlagkräftiges Aktiv/Passiv Boxen Set mit 2 x 25 cm Subwoofern und 1200 W maximaler Belastbarkeit, direkte MP3-Wiedergabe von USB-Sticks oder SD-Karten. 2 x ampli PA Skytec "PRO-1000" avec chacun 1600W. Skytec AMP-1000 Ampli DJ PA Sono MOSFET Rack 48cm 2U 1600W. Set sono PA "Bass First Pro" 2 amplis 4 enceintes mixer DJ casque micros. 2 x Skytec AMP-1000 Ampli DJ PA Sono MOSFET Rack 48cm 2U 1600W. 'Soundsaver' PA System - Paar Lautsprehcer, Verstärker & Stative. 1 x Paar PA Boxenständer Lautsprecherstativ Flansch Tasche. 1 x Ibiza AMP-600 DJ PA Endstufe Verstärker 960W MOSFET Rack. Transportables PA Set mit zwei leistungsstarken Fullrange-Boxen für feinsten Klang und vollen Sound. (1) Focusrite SCARLETT STUDIO 2i2 2nd Gen 192kHz USB 2.0 Audio Interface Mic Headphones. Scarlett 2i2. Free bi-monthly plug-ins from Focusrite’s Plug-In Collective. Focusrite SCARLETT STUDIO 2i2 2nd Gen 192kHz USB 2.0 Audio Interface Mic Headphones.